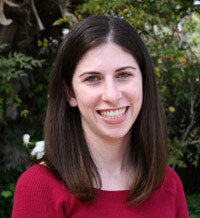 Julia Levine was born and raised in the San Fernando Valley. She has a Bachelor’s degree from University of California, San Diego with a double major in Judaic Studies and English Literature. Julia continued exploring her love of Jewish education by earning a Certificate in Jewish Day School Teaching as a DeLeT: Day School Leadership through Teaching fellow. In 2007, she received a Master’s degree in Jewish Education from the Rhea Hirsch School of Education at Hebrew Union College-Jewish Institute of Religion in Los Angeles. Julia has a passion for formal and informal Jewish education and spent 16 summers at Jewish summer camp as a camper, counselor, educator and administrator. Before coming to work at Temple Ramat Zion, she worked for several years as the Experiential Educator at Sinai Temple in West Los Angeles. Julia, her husband Adam, and their daughter Hannah are very happy to be learning from and with the Temple Ramat Zion community!